These eload products will be removed accordingly from the LoadCentral platform. In case product can still be found on the webtool, a “Transaction is NOT Allowed” error message will be prompted. 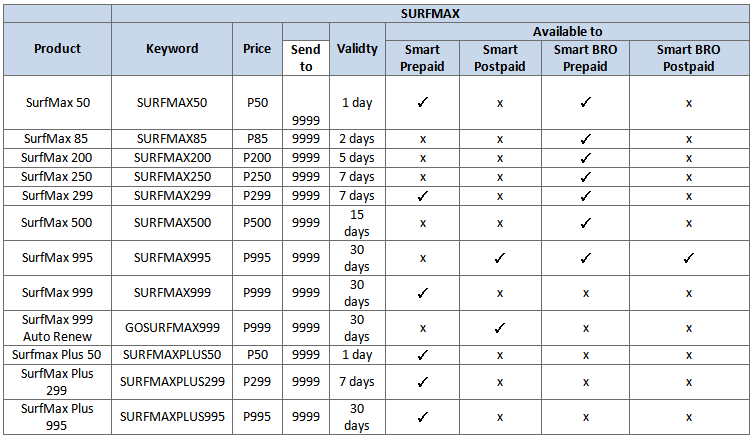 The Smart Surfmax promo will replace the Unlisurf promo packages. It is the newest all-day internet offer from Smart. It allows you to enjoy all day surfing for as low as P50/day. Right now, these denominations are only available via subscriber registration. For the meantime, we will wait for Smart’s advisory once these new data packages have been enrolled to their retail system. For your guidance and reference.